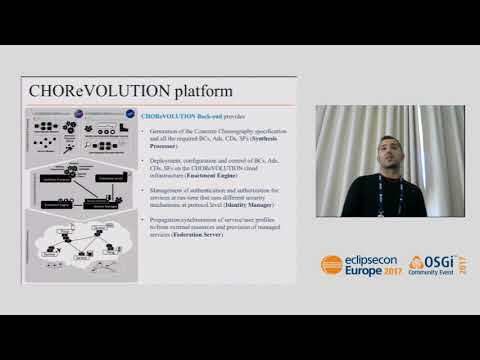 CHOReVOLUTION participates in EclipseCon Europe 2017, October 24-26, in Ludwigsburg, Germany. The EclipseCon Europe team has accepted a CHOReVOLUTION talk in the track "Tools, IDE & DeVops"
Presentation Title: CHOReVOLUTION Studio, an Eclipse environment for composing Internet of Everything Applications. Speakers: Claudio Pompilio, Alexander Perucci from the University of L'Aquila, Italy. Find more on the EclipseCon Europe 2017 website.